A new locking device which converts the standard Debris Cap™ into a formidable lockout mechanism is now available. Recent OSHA rulings are very clear regarding the protection of personnel who may find themselves in hazardous situations if valves, switches, etc. cannot be quickly locked out, or if those switches are opened or closed while work is being performed on a line. The ability to lock out riser access to water/gas/sewer valves has heretofore not existed in any acceptable fashion. With the introduction of the locking Debris Cap™, this standard can now be met. 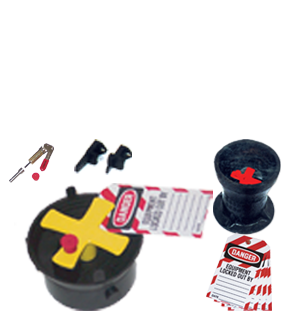 Utility companies, citing their desire to adhere to the intent and purpose of the OSHA requirements, while at the same time saving immeasurable dollars over the previous procedures to accomplish compliance, have begun requiring locking Debris Caps™™ on isolation valves, zone valves, split valves (between pressure zones), etc. as well as in their maintenance programs. "....the agency must promulgate the standard which assures the greatest protection of the safety or health of the affected employees .... the standard's preference for locks over tags is warranted by the fact that lock-based safety programs are less susceptible to human error and thus can be expected to save more lives and avoid more injuries than tag-based programs." The agency reaffirms its finding that lockout is a superior means of protection .... the final standard requires employers with lockable equipment to use lockout unless the employer is able to show that the use of tagout will provide a level of safety equal to that of a lockout program."